Can somebody help me out with some info and pics regarding the correct setup for the SA big brake hydraulics on 14" Syncro uprights? 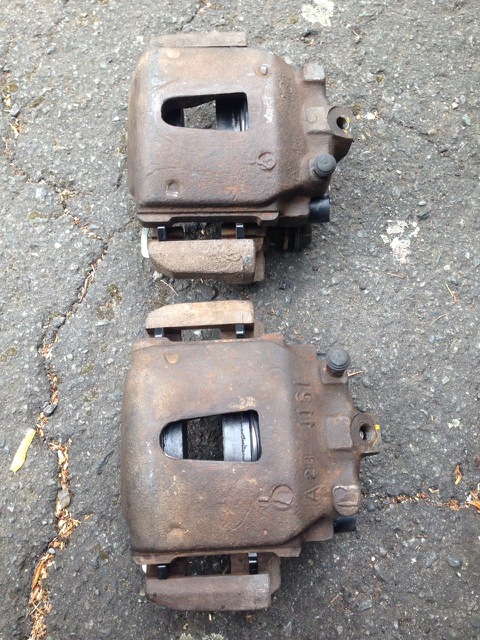 I've currently got standard Syncro Girling calipers fitted which have the pipe feed in a different location on the caliper - lower rear corner on the Girling vs top centre on the SA caliper, and which have a tapped blind hole on the caliper body for the hose bracket. Can somebody please help me with some info as to the correct pipe, hose and bracket setup to use and a couple of installation shots showing the hydraulic setup? Since the calipers come from the 2wd 2.6i, I can tell you that the hoses run direct from caliper to body fitting/hard line and are a unique SA part. Cant tell you the length cos my bus is parked up at work and it also needs front hoses for MOT, good time for a collaboration? I am snowed under with work though, no time for me to run up to Think Automotive in Isleworth and get some made. Can't find a better pic just now, but I am pretty sure that the hoses have a M10x1 banjo bolt to connect the hose to the caliper. Okay that makes sense now. 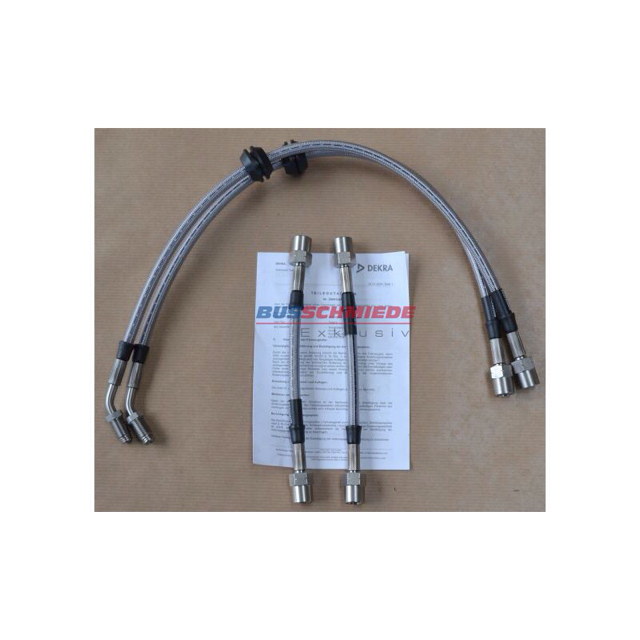 Busschmeide do a set of flex hoses for 2WD SA brakes with a cranked end fitting for the caliper - I'm guessing that these could also therefore be used for Syncro setups? The price is a bit steep so I'm guessing it would be cheaper to get them made over if we can get in touch with a decent fabricator? Last edited by clift_d on 22 Jul 2018, 18:02, edited 1 time in total. The critical thing is the length. Might be worth asking Russel if he has had them made and if the 2wd hoses are the same length? They need to have slack when at full droop & full lock, of course. Its not the price of the hose, its the labour for the cutting & swaging operations. Since I only need the front hoses, and given that shipping from Germany would be on top of that price, a UK source will almost inevitably be cheaper. What sort of timescale are you talking about for any hoses for your MOT? Ideally I need to source something in the next 7-10 days so that I've got time to get these brakes fitted and tested prior to our holidays. Likewise I am on short time because the bus out of ticket and I got a letter from DVLA saying I only had a week's tax remaining! Against that, the big CNC will run itself.for a couple of hours once set, so it does buy me some time to dash out. I'll see what I can do. Early starts required. I've posted a query on the SA Syncro forum to get an overall hose dimension, and I'll pass this on if I get a response. However, if you know someone who might have an OEM example to work from then it might be an idea to ask them separately. See how you get on this week, if you don't think you're going to get a chance just let me know. Push comes to shove, I can always UPS a set from Busschmeide. Goodridge brake hose is another option, almost universally used in motorsport applications and if you don't want to buy the kit (or it's not available) you can buy the hose and fittings separately and make your own. Quite easy to do. Great. Thanks for that link to an extra possibility. Just to add a bit of extra confusion, I've just noticed that Busschmeide also do a separate SA Syncro hose kit which has straight ends to the caliper, which I suspect may put too much strain on the hose end? I think I need to try and find some images of an OEM installation to copy but I haven't found very much yet. Last edited by clift_d on 23 Jul 2018, 11:16, edited 1 time in total. 22S part numbers dont cross-reference to anything! VWSA only. My memory fails me...the caliper connection is straight, but the 2.6 has the hard line connection to the rear of the axle line. If I'm reading your pictures correctly that would suggest the SA hard line connection is located 'behind' the drive shaft rather than in front, which is different to our van. Also, is that vertical bit of metalwork in front of the spring in the first image an SA specific 'shield' to keep the brake line away from the front spring as I'm not sure we have that either. On our van the hardline connection is 'in front of' the driveshaft and the flex hose runs outside of the front springs behind the front upright, and is restrained loosely to the back of the upright by a p-clip. If the SA OEM installation is that specific then the likelihood is that neither the Busschmeide hoses nor the OEM SA hoses would fit anyway, in which case my best bet may be to look at a Goodrich Buildaline option? You won't regret Goodridge..... better brake pedal as they don't "swell" when the pedal is pressed and the stainless outer doesn't rust and is better protection. Minor downside is you cannot clamp them. Most difficult bit will be determining what fittings you need. DIY is easy if you have a bit of patience, you have freedom to select the length you want in situ that way. 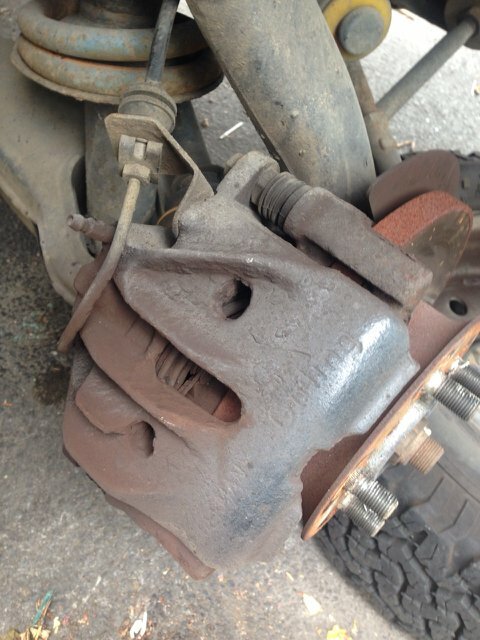 You are correct in the first instance, all hydraulics are behind the front axle line. Remember that those pics are of a 2wd SA bus, detail differences in the front spring towers, never mind being different to syncro. I would hope that Busschmeide would have already done their homework and made the hoses the correct length for each application. PS Think Auto use Aeroquip hose and fittings.